Barcelona failed to win at Las Palmas Thursday night as Lionel Messi’s first half freekick goal was canceled out early in the second half by a controversial penalty. 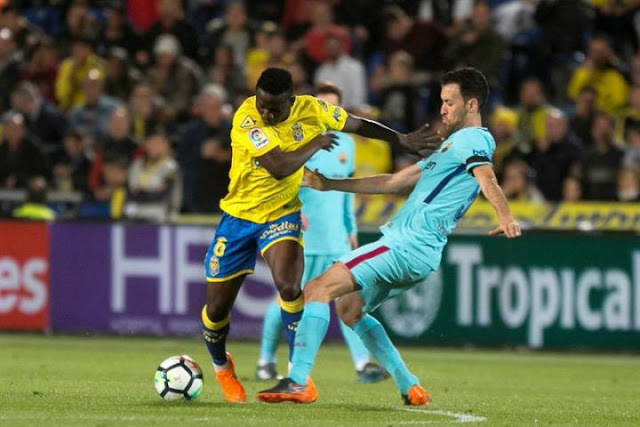 The match saw one of Nigeria’s Super Eagles World Cup hopeful, Oghenekaro Etebo, impress for the home side as he was a constant threat to Barcelona’s back four even though he was used as a second midfielder at the base of his team’s midfield. Though Messi only managed one goal, he was magnificent and had to be brought down by the opposition defence on a number of occasions he had opened up their defence. The Argentine won same freekick he dispatch with a Messi-like precision. On Las Palmas controversial penalty, Barcelona coach, Ernesto Valverde said left him with “a bad taste”. This has now made Barcelona’s match against second placed Atletico Madrid on Sunday even more important for the home side as they now lead the cut with just five points. Atletico in their midweek fixture thrashed Leganes 4 – 0 with Antoine Griezemann scoring all four goals. Messi‘s brilliant free-kick looked set to restore their advantage to seven points ahead of this weekend’s showdown at the Camp Nou but two decisions from referee Antonio Mateu helped lowly Las Palmas take a share of the spoils.